It's been a while since we talked about the incredible films coming out of Severin Films sub-label, Intervision Picture Corp. While the big brother focuses on lost, but not forgotten classics of international genre cinema, the younger more rambunctious sibling is busy digging shot-on-video and outsider art oddballs out of the dirt and presenting them to the world for what is often the first time. The latest pair of Intervision DVDs is a perfect example of the kind of film that they thrive on and very few others are interested in touching. The pair of shot-on-video oddities, Canadian auteur driven thriller Beyond the Seventh Door, and Video Nasty-era killer kids shocker Suffer, Little Children make what I believe is their DVD debut and these are two films you have to see to believe. I had no idea what I was getting into when I popped in the disc for director B.D. 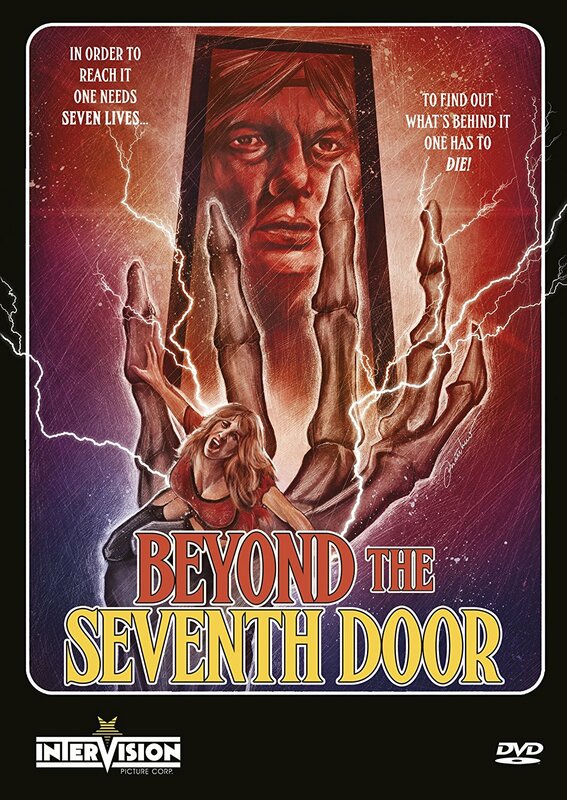 Benedikt's bizarro psychological thriller, Beyond the Seventh Door, but I was perhaps even more confused after watching it. Boris (played by the incredibly named Lazar Rockwood and sporting a delightfully absurd Yugoslavian accent) is an ex-con who has talked his former girlfriend (Bonnie Beck) into taking a shot at robbing her rich new boyfriend's mysterious castle. She assures him that it'll be worth it if it pays off, but also that the boyfriend is very fond of games, and before they can get their hands on his treasure, they'll have to solve and survive seven potentially deadly puzzles, each one crazier than the last. Shot on a shoestring budget and acted in such a way that it's almost impossible to believe that the film even exists, Beyond the Seventh Door is the kind of outsider art that can only come from the mind of an auteur, because if even a second person had been involved in this production, they would've shut it down immediately. Benedikt's dialogue filtered through Rockwood's acting is like a game of heavily accented telephone, where the affect doesn't match the emotion 90% of the time. Combine that with no-budget special effects, crazy killer puzzles, truly uncomfortable love scenes, and Lazar Rockwood's unfuckwithable hair, and Beyond the Seventh Door almost immediately shot to the top of my list of what-just-happened classics. Show on video, this DVD looks and sounds about as good as one might expect, which is to say, not very. However, I'm sure it is preserved in the most exceptional method possible given the source material. As is often the case with home video releases from the Severin/Intervision group, the bonus materials really make the package worthwhile, and Beyond the Seventh Door is no exception. I don't think it'd be a huge stretch to imagine that more time and effort was spent on creating these materials than the original budget of the film. First, we get an audio commentary with director Benedikt moderated by the venerable Paul Corupe, Canadian film expert and webmaster of Canuxploitation.com, which is every bit as odd as you might imagine. However, the main extra is a 20+ minute making of featurette that reunites Benedikt and Rockwood for some conversations that must be heard to be believed. Benedikt has gotten out of production and is now in exhibition as the proprietor of a cinema in Canada, and Rockwood, well, he's still Rockwood as he describes his acting style and his animal inspirations for his performance. If the film didn't make any sense before watching these extras, it makes both absolutely perfect sense and even less sense after watching them. Baffling. Perhaps the most interesting extra, and one of the craziest things I've seen on a home video release in a while, is a featurette called The King of Cayenne, which profiles a semi-famous Toronto area eccentric named Ben Kerr who appears in Beyond the Seventh Door for one or two very brief shots as a drowned corpse. Amazing. If you love ridiculous films that feel like they've come from outer space, Beyond the Seventh Door is likely to tickle your fancy. Definitely recommended. In the early '80s, with the introduction of home video and the advent of relatively inexpensive video recording cameras, there was a sense that anything was possible. Kind of like the summer of love, but for people with fucked up ideas and a love of fake blood. The result was an overwhelming wave of shot-on-video horrors that - though they might have been objectively terrible films - were able to sustain themselves by simple virtue of the fact that video stores needed product, so the bar was set pretty low for quality. Films like David Prior's 1983 Sledgehammer proved that anything was possible, and that with just a video camera, some friends, and a vague idea of ways to visualize violence, movies (and money) could be made. Sledgehammer was like The Ramones of the filmmaking world, it was so simple and borderline dumb, that it proved to a lot of would be artists that they could make movies, too. One of the films that came out of that boom was director Alan Briggs' killer kids splatter fest, Suffer, Little Children. When a mute little girl named Elizabeth appears on the doorstep of orphanage, her silence is creepy, but she seems harmless enough. Soon after a famous former boarder at the home comes by to pay a visit and do some charitable work, and out of nowhere people start dying in very gruesome ways. No one can quite pin it on the little girl, but somehow she seems to be at the center of the madness. One by one the home's young residents turn into Satan worshipping killers, and Elizabeth may just be more in control of what's going on around her than she's letting on. With a crazy-go-nuts ending that you have to see, Suffer, Little Children is a fun little mind-melter that you'll never forget. The image quality on Suffer, Little Children is significantly less than that of Beyond the Seventh Door, but the source material looks like it was much worse for the wear in the first place. Hardly shot using the pro-sumer gear that the latter had to work with, Suffer appears as though it was almost cobbled together from someone's terrifying home videos on consumer grade cameras shooting in the EP mode to save tape. An authentic experience for sure, but not terribly pleasing to the eye. In terms of extras, Intervision brings the thunder again, however, the subjects were less interestingly outré for this film than the other. There is an interview with director Alan Briggs in which he shares fun stories about the production of the film and describes the intent ($$) of the film. The more interesting and enlightening interview with contemporaneous fanzine writer John Martin who not only places Suffer, Little Children into its proper context for 1983, but also gives more details regarding the film's life cycle as it passed in and out of offices with cuts made here and there and how the final product matched up to the original vision. Suffer, Little Children is a weird little movie, and less obvious culty material for me than Beyond the Seventh Door. However, fans of a certainty persuasion and tolerance level with get a lot out of this film, which feels a lot like a backyard production.